Years ago, it wasn't unusual for girls to still be playing with Barbie dolls at the age of 13. It's a little different today and many parents want to know at what age they can expect their daughter to outgrow playing with dolls. The answer is not simple and every child is going to be different. Some may lose interest in dolls at 7 or 8, while others may enjoy playing with them through their tween years (ages 9 through 12), or even longer. In Barbie's early heyday during the 1960s and '70s, girls often played with Barbie until their early teens. Barbie remains a popular toy, though many people are finding that her appeal is being lost to older girls. This trend did not go unnoticed by Mattel. 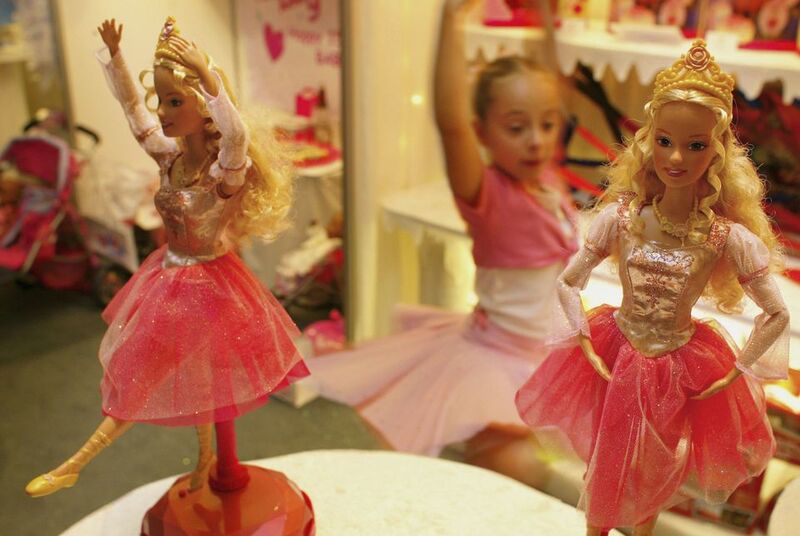 In the early 2000s, people began noticing that girls were outgrowing Barbies as early as 8. In response, Mattel tried producing "hip" and "cool" dolls like the "My Scene Barbie" dolls and "Flava dolls." These were designed to keep the interest of tween girls and compete with the likes of Bratz dolls, which quickly took a large share of the tween market from Mattel. There are a variety of reasons as to why girls are outgrowing Barbie at earlier and earlier ages. Despite stereotypes, not every young girl loves pink. If Barbie was all frilly, cotton-candy pink, many girls wouldn't have wanted to play with her. For the first few decades of the toy's life, Barbie dolls were more sophisticated. They had real clothes, perfect replicas of career outfits (e.g., nurses, business people, etc.) or glamorous copies of real-life evening and day wear. The accessories reflected reality too, with real telephones and relatively realistic food. The clothing and accessories were quality miniatures and fascinating for older girls. Today, the majority of things in Barbie's world are not only cotton-candy pink but also frilly and sparkly and sweet—and very, very fake plastic. Mattel hasn't made realistic accessories for years, and the clothing tends to be cheaply made and frosted with glitter. Of course, given the pink, fantasy presentation of Barbie these days, she appeals more to a 3-year-old than to an 11-year-old. However, if you brought those same 11 year-olds into a collector's doll shop and show them a quality doll—the Modern Circle dolls, or Elle Woods, or even Sandy in Grease—most would be fascinated. It's not bad enough that Barbie is seriously pink, but she also comes packaged in a well-defined role for which imagination need not apply. Decades ago, Barbie was just Barbie. She might have had a twist and turn waist, or a new "American Girl" hairdo, or real eyelashes, but she was a blank slate. Girls got to choose her outfits, her personality, and her roles. Little girls today get Barbies with defined personalities: "Fantasy Mermaid," "Ballet Barbie," or "Happy Birthday" Barbie. This is fine for a 3-year-old or even a 6-year-old. Older girls, on the other hand, tend to have more sophisticated imaginations, and they need more sophisticated playthings. Of course, it's not just that Mattel has taken Barbie and changed her into a toy for younger children. Today's culture, in general, has taken children and made them grow up faster. Tweens are bombarded with adult-like images of themselves in movies, on television, and in popular music. Instead of wanting to be children, tweens want to grow up immediately into little adults. They wear midriff blouses, low rider pants, and makeup; they see PG-13 and R-rated movies; they listen to edgy music. Dolls also have to compete with kids' attention spans against technology like tablets, smartphones, and social media. With all of that, it's almost natural that tweens of today no longer see themselves playing with dolls. Each girl is an individual, though, so many may still enjoy dolls well into their teens, even if it's in private. No matter which end of the spectrum your daughter falls into, there's a strong possibility that she'll eventually come back into the fold and join the ranks of adults who enjoy collecting dolls.